Product of the month February 2019. Honeywell MICRO SWITCH MT Series miniature toggle switches are designed to meet the need for a rugged, cost-effective toggle switch. Quality construction features include a seal between the toggle lever and bushing, and between the cover and case. These switches are designed for use in applications in many demanding outdoor environments, where the panels are subjected to such things as vibration from equipment, temperature extremes, dust, splashing water, and/or hose directed water. They are capable of withstanding exposure to heavy accumulations of early morning dew that may condense on the control panel in cabs of vehicles left outdoors overnight. 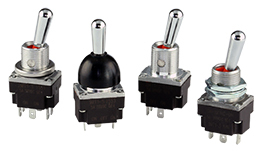 The MT toggle switches with metal or plastic levers are well suited for gloved-hand operation. The panel stand-off with O-ring feature available on some listings eliminates the need for behind-the-panel hardware, provides a uniform panel height, and a panel-to-cover seal. For more information, please check the Data Sheet and the Application Note .